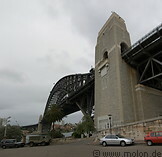 The Rocks area is at the heart of historic Sydney. Here is where captain Arthur Philip proclaimed the establishment of the city of Sydney in 1788. This is an area of narrow alleya and cobbled streets, which was saved from demolition and restored in the 1970s. The area has many restaurants and eateries of all kinds, pubs dating back to the early days, a lively market on weekends and plenty of entertainment.